Saving Face won the awards for the Best Docume­ntary and Outsta­nding Editin­g: Docume­ntary and Long Form catego­ries. 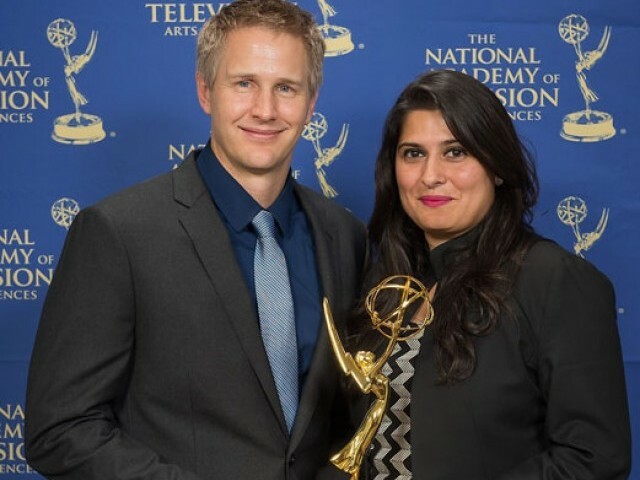 Academy Award-winning Pakistani documentary Saving Face has been awarded two Emmy Awards at the 34th Annual News & Documentary Emmy Awards. 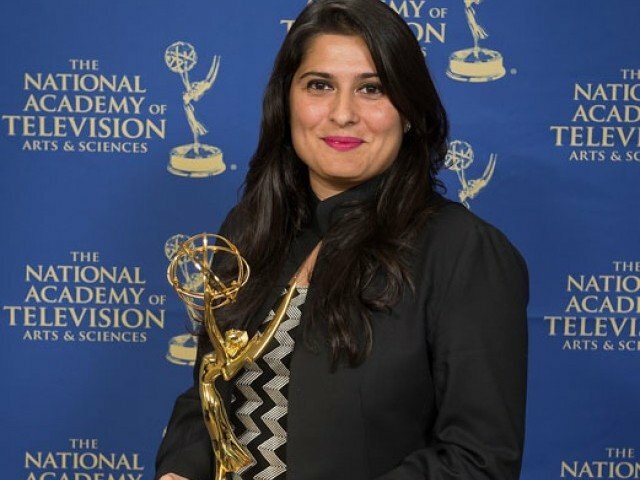 This marks the second Emmy win for the film’s director Sharmeen Obaid-Chinoy, who previously received the accolade in the Current Affairs category for her documentary Children of the Taliban. Saving Face won the awards for the Best Documentary and Outstanding Editing: Documentary and Long Form categories. The award distribution ceremony of the 34th Annual News & Documentary Emmy Awards was held on Tuesday, at Frederick P Rose Hall, in New York City. The film’s Oscar-winning directors Obaid-Chinoy and Daniel Junge along with cameraman Asad Faruqi represented the Saving Face team at the event. Obaid-Chinoy shined at the event in an ensemble designed by Sania Maskatiya which she paired with a Popinjay handbag by Saba Gul. The documentary film was nominated for five catergories: Best Documentary, Outstanding Editing Documentary and Long Form, Outstanding Science and Technology Programming, Outstanding Cinematography Documentary and Long Form, Outstanding Research. The event was attended by more than 1,000 television and news media industry executives, news and documentary producers and journalists. Did you know? : Saving Face nominated for five Emmys! The excellent work done by Obaid-Chinoy and her team proved itself once again. The overreaction by the media turned Sikandar into a very important man. Feature films: Will Pakistan end 50-year silence at Oscars? Pakistani Academy Selection Committee is welcoming submission for the Foreign Language Film award. Wow! This lady is on a roll! Congrats!! Yes, i think this was more important that which designer designed her clothes and whose bag she was taking with her. Great news in this severe time of hopelessness and pessimism. Please look for such encouraging news to give hope to the next generation. someone is making lot of money by derogating our country and showing us on poor light… our image over the world has taken a serious beating because of this lady, that too working for a British guy. US propaganda. Its irritating to see her bag awards everyday for distorting image of our beautiful country. Why didn’t her documentary regarding violence in Afghanistan by NATO troops won any awards? Liberals of this society are such sheeples by the way. I mean these are the people that chant for Malala for crying out loud. Pathetic. Her documentary “Children of the Taliban” is very scary.Every Pakistani should see it and realise the wrong path that the country is on.But I suppose it is banned in Pakistan. Well Done Asad Faruqi, proud of you. Congrats!! I am so very surprised at the negative reaction from your country citizens like @Sara [email protected] @jin The lady made a film about your country about the social ills you must remember there are not many positive subjects in your country at this time, so maybe you would be satisfied if she made a film about…Taliban the Musical…..or….Taliban method of trying to kill a school girl? Have u ever even seen a taliban or whose really controlling the group of militants attacking Pakistan on a regular basis? NO! So you cant just make up straightforward conclusions about what is happening right now. I am pretty sure you are a Malala supporter, propaganda denier, conspiracy theories critic,US apologist and worst of all a Pakistani basher. @jin instead of directing your anger at me it should point to the forces that makes your country that recently attacked the Pakistani-Christians and it’s with your support your pals the Taliban are hurting, killing & forcing Pakistan to be the most feared country in Asia. Pakistan does not need anyone to bash it you all are doing a BRILLANT job of doing it yourselves. @lovegood instead of calling names what have YOU done to protect violent abuse against women? Any coward can stoop to disgusting name calling we women in Pakistan have a mega problem in domestic abuse and killing you would rather pretend this does not exist and sweep it under the carpet! no one is calling anyone “names”. Get your statements correct. I have done more to end violence than these propaganda endorsers sitting here. People like you come on ET and dumb this garbage of self pity complaints that ” ohh WE bechari women in Pakistan have trouble even breathing” and what not. You have no right to conveniently merge yourself with that segment of women that actually suffers from domestic abuse. You’re not doing anyone a favour by including the word “WE” in your statements since you have done nothing except taking advantage of their misery. Sitting in your banglows, living like queens, throwing shoes at your maids, yelling at your MALE drivers and then complaining on ET of how how Pakistani women suffer at the hands of the cruel men. Lastly, for God’s sake learn to be grateful for the respect this nation has given to your kind of women or atleast begin to identify it by getting out of your narrow frustrated mindset. Shhh…..Sharmeen Chinoy our male population will call you names …forbid the fact they want to silence these crimes against women to hide their inability to accept reality that women are required to accept a lower class of life. Anyone who objects to Miss Chinoy is throwing their support to the perpetrators of violence against women & girl that is why Taliban feels motivated to try & kill young girls going to school soon they will round up our girls to present them to the Taliban carry to out their acts against humanity. You do not think that …derogatory excuse of progressive woman stoops to name calling? I beg to differ and you are assuming a lot about progressive women. Domestic violence does Not discriminate by class it’s a fact you need to learn. May the cheap Bollywood films have clouded your views about women what your description is like a film plot of a cheap film it best you deal with reality not the fiction created on the silver screen. You are agitated that domestic abuse of Pakistani women & the lack of resources and support from a corrupt police & legal system mainly male-dominated has been exposed & people like Sharmeen & Malala are being trivialized by your kind to feed an ego that violence against women is only a figment of someone’s imagination? oh please woman. I dont even know what you are ranting about now. Please find some inner peace and then come and enlighten us with your stories how this male male chauvinist society has made your life miserable. @loveggod your hostility against woman is indeed troubling! I don’t need to enlighten you with stories about our male chauvinistic society as you probably are the author & composer of them. kindly please refrain from distorting reality and twisting meanings and statements of other commentators to serve your own negative beliefs about Pakistan. If u have so much hate for the men of this country, then I dont know what are u even doing commenting on this blog. Now if Im gonna suggest u to move out of this country, again its gonna hurt your feminine sentiments and ego and ure gonna call us female oppressors. Lastly, So ure sayign that an example of a male chauvinist society is where the WOMEN win oscar awards rather than the “male”? Wow we’re definitely a male chauvinist society. rollseyes. Learn to develop an open mind, start seeing things from different perspectives and may you will learn to appreciate the beauty of this “male chauvinist” society.